On Saturday, February 3rd, 7 hardy birders joined EOB in a search for Black-backed Woodpecker and Red Crossbills in Central Frontenac. The wind in the morning was quite low, which made for great conditions for listening for woodpecker activity. In the end, we dipped (missed out on seeing) on Black-backed Woodpecker, but we had several notable Red Crossbill sightings. Unfortunately, with the good sometimes comes the bad; we observed two Red Crossbills get struck by a vehicle, a sad truth for many winter finches gritting and salting along busy roads. We had a short but nice hike in to Ardoch Pit, where we observed several noteworthy birds, including an adult Bald Eagle and a Northern Shrike. We had a single White-winged Crossbill flyover at this site, as well. The bird of the day, however, was neither a crossbill nor a woodpecker; it was an eagle…of the Golden variety! At one of our stops, Betty Michalowski spotted a distant eagle in flight. I have learned from experience that when Betty spots something, I had better hit high gear to get over to her; her eyes mean business! We chatted about the closer bird and decided on immature Bald Eagle for its ID. However, just before walking away, we spotted another bird above and beyond the immature Bald. 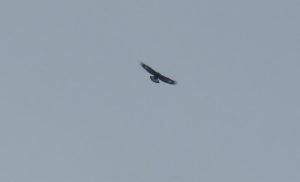 It was eagle-like in that it was soaring in slow, broad circles. Its wings were held in a shallow dihedral. It has a small head and a long tail. It was a first winter Golden Eagle! A fun day in the field (yet another one) polished off with a delicious lunch at The Old Mill at Ashton with friends. 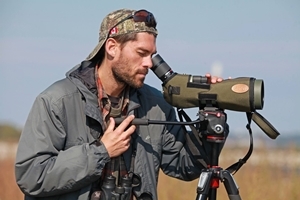 I say, the life of a birder sure is the life for me!